SS is short for the German Schutzstaffeln, an organization, of which the Gestapo was just a branch, serving the tyranny of Nazi bureaucracy and the politics of terror, like MI5 currently in British Occupied Ireland and all of the island. The British Government use MI5 today, like Germans in high places, still use the SS, as an excuse for acts of murder, extortion and genocide, that were facts of daily life under the Nazis and are standard fare since the outset of the present troubles in British Occupied Ireland. 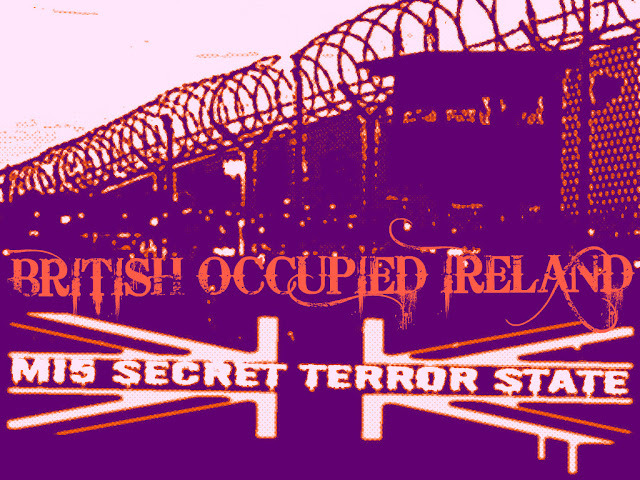 MI5 like the SS are embedded in every basic governmental part of the Occupation of Ireland and indeed most institutions of note on the island. While not all of its members are not so much lunatic killers, as loyal British subjects, doing the bidding of a secret state of British intelligence, that has gone insanely rogue and unaccountable. The case of the politically interned Marian Price is but another example. Outside her internment, the life of Marian Price has been destroyed by the “grossly reckless” conduct of Britain's secret service MI5 terrorists. Marian is a victim of “targeted malice” of a prejudged faceless secret service of secret judges, secret jury and secret executioners. MI5 and the British secret state has manifested a perverse calculated effort of secret political internment, to give effect to their prejudgment, that secret evidence, with the vested interest of highly paid secret informers, to the British secret services. The malfeasance of British bigoted, sectarian public office of British institutions involved in cases such as the Guilford Four, the Birmingham Six are infamous and par to the same form of injustice that fuels the ongoing conflict. The consequence of destroying irreparably the lives of Irish women and their families is a prime cause of the ongoing troubles. In the case of Marian Price six months of force feeding, a year of psychological torture in solitary confinement, combined with her second Christmas politically interned without a transparent trial that is calculated to destroy her physically and mentally.The British having accepted the allegations from the outset and have at every step sheltered the allegations from appropriate public scrutiny, thereby ensuring that Marian Price would suffer the maximum painful agony in her confined condition.The political internment of Marian Price has been conducted in a manner calculated to ensure a predetermined conclusion not to be deflected or disturbed by any meaningful input by Marian Price or her defence lawyers. Besides the psychological torture endured by Marian, her indefinite internment, coupled with seriously painful physical condition as a result of her treatment at the hands of the British, Marian has endured extraordinarily high levels of stress and great mental anguish suffered in isolation. The reality of the abuse of British Occupation behind the cloak of secrecy provided by the Official Secrets Act, the secret services, secret evidence, secret witness, secret courts, secret allegations and secrecy provisions governing matters concerned with the secret Nazi regime running British Occupied Ireland, is that there is absolutely no accountability.The fact is, that this bizarre form of political interment and conduct detailed again below, evinces the unjust reality of life in British Occupied Ireland. The fact that it has dragged on so long, is confirmation of the abdication of judicial, journalistic and political responsibilities, that are basic to any form of a civilized state with even a modicum of democracy. Where to begin describing the secret reality behind the cloak and dagger operations of Britain's spooky secret state?. How to lift the fog of secrecy, complacency, that has been allowed to congregate around the public’s understanding of British Secret State Terrorism? "Targeted assassination", "Political Internment", “Malfeasance”, “targeted infiltrated media malice”, “unaccountability”, "war crimes", "human rights abuse", these are but a few of the terms that encapsulate what I am trying to explain. These phrases refer to the oppression of one Irish citizen (British commoner) by an agency representing the British Police State of Occupation, paid for by British taxpayers. The perpetrators in these crimes against Marian, will likely never face a court of law, will probably never be photographed, as they hide in secrecy, unaccountable from the public gaze. They will never have their names in the media but rather these state terrorists, will continue in their positions, unfazed to murder and intern without trial human rights lawyers, journalists and prisoner rights activists such as Marian Price was before her internment. The facts are that Marian Price is just one, of several Irish people currently secretly politically interned in British Occupied Ireland, during which time lawyers have not been allowed to see any of Britain's ‘alleged’ evidence. • Her release has been ordered on two occasions by judges. However, on both occasions the British Vice royal has overruled those decisions. • The Vice royal claims they ‘revoked Marian’s license, ’despite Marian never being released on license. She was given a Royal Pardon. • Marian’s Royal Pardon has ‘gone missing’ from the home office (the only time in history). The British Vice royal has taken the view that unless a paper copy can be located – it must be assumed that she does not have one. It is generally agreed that MI5 shredded her majesty's pardon. • Despite no ‘license’ existing for her release from prison in 1980, it is the non-existent licence that is being used to keep her in prison. • She can only be released by Theresa Villiers the current Vice royal responsible for Marian's internment. The charges against Marian were thrown out of court because of a lack of evidence. Now the very same charges have been re-instated against Marian again before the same Judge. In secret courts, being introduced by the back door, through legislation in the House of Lords, MI5 the British secret services are pushing for secret trials, with secret evidence by secret witnesses, that the defendant's appointed lawyer is not allowed to access, see or refute. The length of sentence is also kept secret, under penalty of a long jail sentence by Britain's Official Secret's Act. This trial of Marian Price is believed to have already occurred in secret, with the public hearings and a show trial being simply a public rubber stamp on more injustice against Marian Price in of British Occupied Ireland. Gardai don’t know where the shooting took place but find the car that brought the victim to St James’s in Dublin. A 35-YEAR-OLD man died last night after he was brought to a Dublin city hospital. 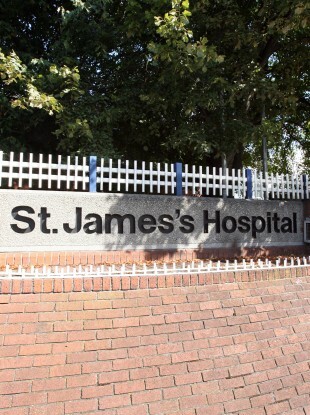 The man was left at St James’s Hospital, with gunshot wounds, at 7 pm. He was pronounced dead at the hospital. Gardai are investigating where the shooting took place as the location is not known. The car used to carry the man to hospital was later found on Cork Street in Dublin and the area around it for technical examination. 'brainwash' Long Kesh hunger strikers to end their protest individually. the hunger strikes -- and as they died, dispose of their bodies at sea. campaign against the criminalisation of the republican armed struggle. they lay starving to death in the prison hospital. defensible because it would be seen to have prevented "pointless"
propaganda effort would be thrown". bear on the prisoner and his family. in the normal course of events," he said. strikers made it difficult to implement the strategy. weeks before his condition becomes critical?" raised concerns because it would require drugging the prisoners. to intervene to save the lives of their loved ones as they neared death. clothing if the hunger strike was brought to an end. any adjustments," the NIO (Northern Ireland Office) document said. wear their own clothIng and perhaps other moves." His suggestion was ultimately rejected -- but only on cost grounds. the internment of veteran republican Martin Corey. proceedings go before the Supreme Court in London. meaning that the decision was solely based on "closed" or "secret"
currently seeking to challenge that determination at the Supreme Court. to allow Corey the chance to present a defence. out the assessment without access to the alleged secret material. Delivering judgment on Friday, Justice Morgan said there were "specific"
allegations in regard to conversations Mr Corey had taken part in. of a general allegation such as membership of an organisation." said Mr Corey's internment should end. internment of Martin Corey on unseen evidence. for several hours on Monday as the property was raided. in 2006 over its stance on policing. had a warrant," she said. Christmas for everyone," he said. have been carried out any time. police but this is harassment of people on Christmas Eve." incident would have an impact on "public confidence". of my family are disgusted." court hearing in Belfast High Court last week. agreed to impose a wide series of very stringent conditions upon him. these conditions were totally unacceptable. visited by his mother, his wife and his young son. live elsewhere was solely designed to penalise his family. branded as a criminal by wearing an electronic tagging device. totally vindictive, fabricated and unjust action." Union Jack flies over Belfast City Hall. designated days, in line with most other civic buildings. broke out at several such events. roadblocks again caused huge disruption to commuters and shoppers. Belfast later as petrol bombs and other missiles were thrown at police. Further protests were also held in other towns around the north. and politicians said things had moved on. intimidate councillors into reversing their decision had failed. it is for designated days," he said. watching them as well and laughing at them." hunger striker Raymond McCreesh has also infuriated unionists. there was a Sinn Fein plot to undermine unionism by "dilution". salt into an already seeping wound," she wrote. Specials, UDR and RUC and restrictions on loyal order marches. placed upon them," she wrote. capital city of Northern Ireland." has not been any erosion," he said. erosion of British, unionist or military symbols. representative so she should show some leadership. "Belfast is not a city of the UDR or the B Specials or one-party rule. It's a city for all and there is a place for us all in this city." would be cut by 300 euro to 1,375 euro. hotel for [euro]700 a week," adding: "People just have to get on with it." described it as "callous and crass". killing Irish Ash trees, came as a grave psychological blow. proud of what you have achieved," he said. that his government wants to "control the internet". Chinese government to declare certain blogs "illegal". members to contact radio stations with pro-government comments. flag from Belfast City Hall. Significant damage was caused to a boiler room in yesterday's attack. arrived, there was some smoke damage. stored in the boiler room were destroyed. "I presume it would be a fair judgment to make. We can't say [for sure]. It would seem to be. the past couple of weeks." Fr Curran said parishioners were shocked by the fire. lived here for many years. It's very precious to them. has been closed so it is even more special to them. "These people are very generous in their attitudes towards other people. items would be given to both Protestant and Catholic people." "I would say to them we are not your enemies. inter-Church relations and we are anxious to maintain that." sympathies to those affected by the fire. gone and now we are back to this again," he said. earlier this month, also condemned the arson attack. in Dublin, Belfast and London this week under the '30 years rule'. support for Sinn Fein in the aftermath of the 1981 hunger strike. known as the "out, out, out" speech. conflict as "a ridiculous war, a war that should not have happened". in neutral, international waters, with the loss of over 600 lives. government's handling of the crisis at doomed car manufacturer deLorean. Lorean on drug trafficking charges. However, Mr de Lorean had some influential friends in American politics. The memo reveals that on this occasion, his interest was not welcomed. Lorean as being "in a disturbed state and possibly not wholly rational". pantomime" with "a good deal of abuse from Mr de Lorean". William to the Prince and Princess of Wales. A Sinn Fein spokesman today said Dessie Ellis rejected the claims. haven't and all the evidence suggests 2013 won't be any different. out before Christmas. He got the wrong Christmas obviously. years. No wonder they've gone very quiet in the past six months. cross-community action if this year's covenant events are the model. trying to subvert democracy by violence and the threat of violence. negotiation. Who are they to make progress with except Sinn Fein? discussions with Sinn Fein is the only way forward. going to have to live up to their responsibilities.